Maria Altman (Tatiana Maslaney) is just married to her opera singing sweetheart Fritz (Max Irons). Surrounded by her extended family they sing, dance and enjoy the wedding festivities within her parents up market Vienna apartment. The apartment is adorned with expensive art work as befits a successful businessman, including a portrait of Maria’s aunt Adele Bloch-Bauer (Antje Traue). The painting commissioned by her father and painted by Gustav Klimt, who favoured the use of gold leaf in his paintings. Not long after the wedding the families apartment is stripped of anything of value, the family either dead or fleeing across the world, a way of life destroyed. This is Vienna 1938, as the country was “incorporated” into Nazi Germany, the Bloch-Bauer family were Jewish. The many family treasures were “acquired” by the Nazi regime, including a necklace favoured by Herman Goering’s wife. The Adele portrait ultimately ending up at the Belvedere museum, the Austrian Mona Lisa if you will, albeit renamed as “Woman in Gold” to hide the subjects name. Sprightly Californian octogenarian Maria (Helen Mirren), acknowledging the newly formed Austrian restitution of stolen artwork committee, decides what is rightfully hers should finally be returned. However the picture is now worth in excess of $100 million and is represented on fridge magnets and books around the world. Now a source of national Austrian pride, despite the provenance of the artwork, the Austrian government is unlikely to let the portrait go without a fight. 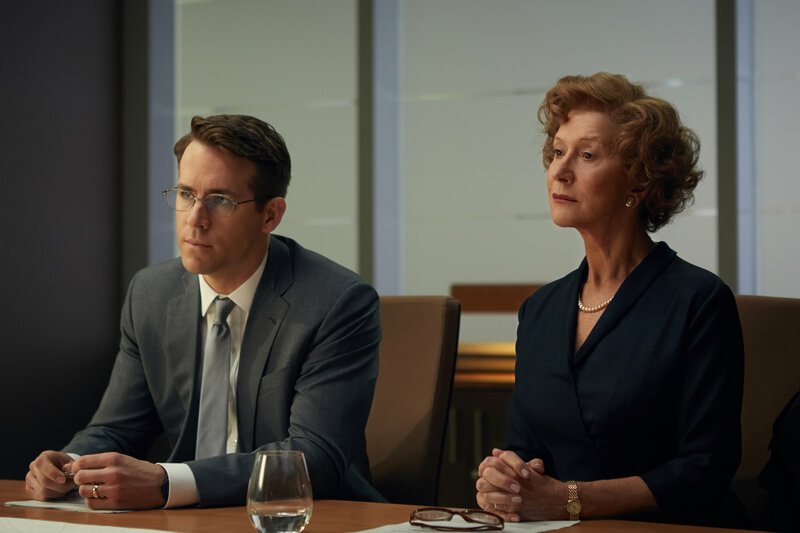 Maria enlists the help of struggling lawyer Randol Schoenberg (Ryan Reynolds), himself part of the extended family and a relation to the famous composer. There begins a long struggle to recover the paintings with the assistance of Viennese journalist Hubertus Czernin (Daniel Bruhl). The story is told in a straightforward “old fashioned” linear manner, albeit with extended flashbacks to the late 1930’s to evoke the period and allow dramatic events to unfold. Mirren is as imperious and effective as ever, arguably reprising her QE2 role but with a Austrian accent, although adding a touch of the archetypal “Jewish Mother attitude”. Reynolds whilst genuine does come across a bit stiff and wooden on occasions. Whilst initially drawn in by the money, over time Schoenberg realised what was at stake. Reynolds fails to make the most of the dramatic opportunities offered in this rich character arc. Katie Holmes plays the long suffering wife as Randol obsessively follows the trail, despite their two young children. One wonders if the mild on-screen representation, accurately reflects the tensions this must have caused. But this is not a film about the Schoenberg family and their more prosaic struggles. This is one tragic story, representing millions of other families that were torn apart, as others looked the other way and failed to act. A lesson that will always be worth re-telling to a younger modern audience, in any well made film about the period.